CADRE Zipwire is a tool that can be used to analyze taut elastic wires or cables with a point load. 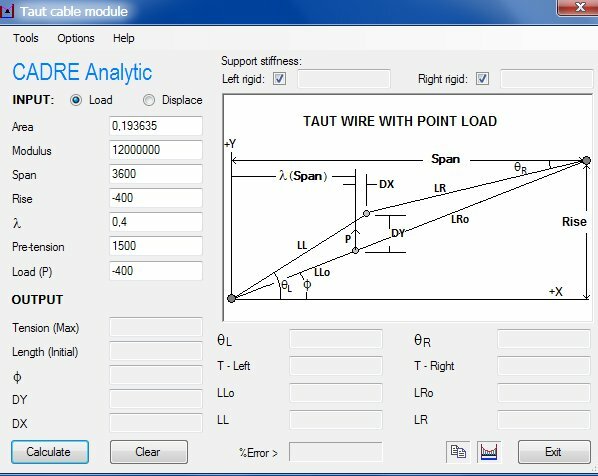 Zipwire solves a class of the hanging or taut cable problem using basic classical geometry and static analyses along with elastic considerations. Zipwire was initially developed as a free auxiliary application for users of CADRE Pro but by popular interest has now been made commercially available to others for separate purchase. * CADRE Zipwire download link provides trial version of the software. UTexas4 is a computer software application for computing the stability of earth and earth-rock slopes and embankments. No one has rated CADRE Zipwire yet. Be the first to rate this product.